Wisconsin Bedding is the place to help you rest easy. We were established in 1929 and are still a family-owned, independent mattress company. Wisconsin Bedding is currently run by Jesse Frank. It is now 4th generation, veteran owned and operated. We manufactured and designed mattresses from a very young age. All of our employees are well versed in the construction and padding of mattresses. We offer a wide variety of different comfort levels. We are low pressure and non-commission. Jesse, Ken, Ryan, and Troy want to help you make the best decision for this very important purchase. Wisconsin Bedding carries one of the largest selections in Dane County of mattresses by Sealy, Stearns & Foster, Therapedic, and Wellsville. We offer a large selection of adjustable bases. Four lines of children’s and adult furniture are also available. 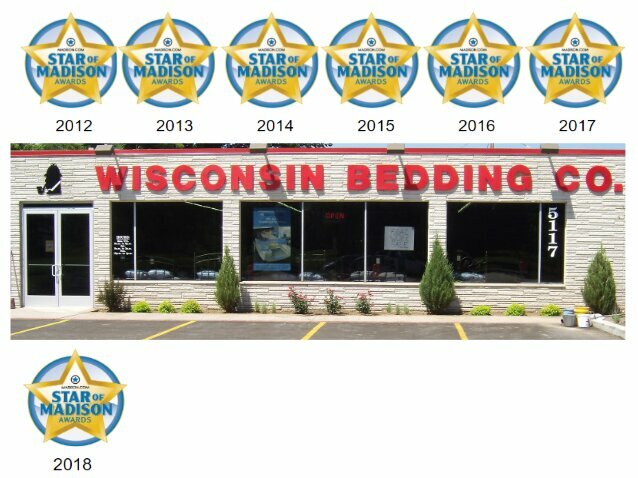 Wisconsin Bedding has won the Star of Madison Award for #1 Mattress Retailer for 7 years in a row. We offer every day low pricing on all of our factory direct products. We don’t play the mark-up, mark-down game. Not only will you get a pressure-free shopping experience when you purchase from Wisconsin Bedding, but you also get free delivery and setup as well as removal of your old set anywhere within Dane County. Wisconsin Bedding Company was established in 1929 by Lester Mylrea and Bill Frank during the Great Depression. It operated as a mattress repair and rebuilding business. Back then, there were not the strict regulations on mattresses as there are today. With many people out of work, people chose to repair their broken and torn mattresses instead of buying new. Today, Wisconsin Bedding exclusively carries new mattresses and box springs in both standard and custom sizes.